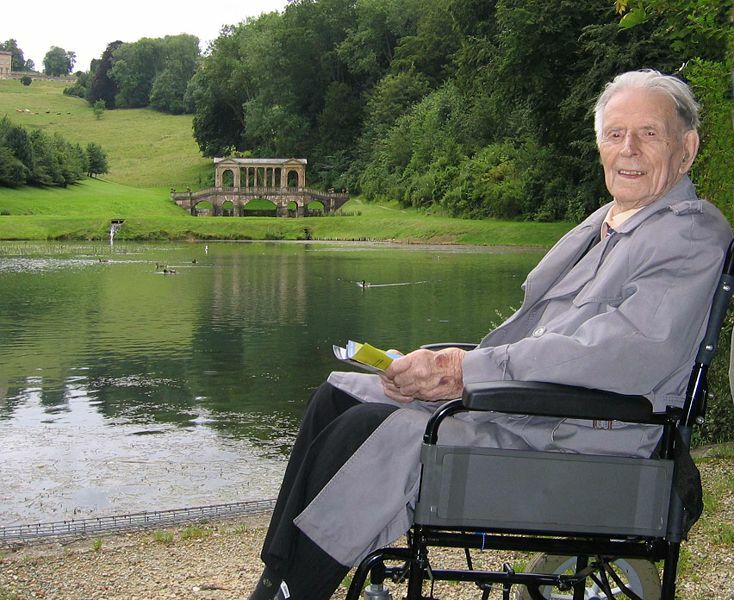 Harry Patch, 110 years old, is the last British soldier alive to have fought in the trenches of the First World War. 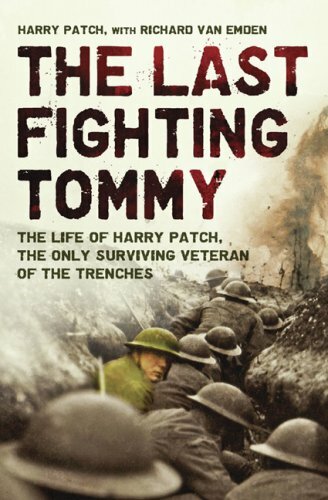 From his vivid memories of an Edwardian childhood, the horror of the Great War and fighting in the mud during the Battle of Passchendaele, working on the home front in the Second World War and fame in later life as a veteran, The Last Fighting Tommy is the story of an ordinary man's extraordinary life. I read this book last year, just before my trip to France. Although moved by this book, being in the area where he fought made it all the more real. The book focuses not only on the time Harry Patch spent in the Army, after being conscripted in 1916 until he was invalided out in 1917, but also on his life before and after. He remembers his childhood with warmth and clarity and the stories he tells are not only important to him and where he came from, but of how England was before the Lost Generation was conceived of. He tells of idyllic days spent in fields, along with his time at school and then on to his first apprenticeship. His memories of fighting in the trenches whilst serving as an assistant Lewis Gunner in the Duke of Cornwall's Light Infantry, are clear and concise, moving and at times comical. Yes, he maintained his sense of humour, despite the horrors he witnessed and endured. A sense of humour only a survivor can have. I found reading about his life after the Great War incredibly interesting. It gives an insight into how life was once the shells had stopped and those that were left returned. And with the second war of his life looming, he tells us of how he played his part. Although the author of this book passed away in 2009, aged 111 (one month, one week and one day), this fact makes his story all the more poignant. Until 1998 he refused to speak of his experiences. He was afforded a gracious and soulful funeral in Wells, Somerset with pall bearers from The Rifles and a pair each of French, Belgian and German soldiers. At his request, no guns were present. I keenly felt the passing of a generation when the news of his death broke. He truly was one of the last Tommy's. This book is a glimpse into the life and memories of a private man who became the focus of so much pride and sorrow. I say hoppy because I feel like I spent the majority of my weekend hop, skip and jumping from one place to another over the Easter break. You didn't think it was a reference to bunnies or something did you? Chocolate ones? A lot of chocolate ones that shall be on my hips until at least autumn? There would have been pictures of them too - had that lasted long enough. Good Friday was spent in glorious sunshine visiting The Beard's family. I was unsure about wearing such a summery frock - but it was so warm, I thought I might as well. Had I applied more moisturising tan lotion stuff, my arms and legs might not have been so pasty - but you live and learn. In the mean time, you put a cardigan on. Dress via Etsy for a whopping £17 including p&p - nice! On Saturday we headed up to see my family - which meant spending a couple of hours in a smoking hot car. Which lead to heated words between me and The Beard about the air con in said car. Whilst the back of my knees began to sweat and my curls began to wilt I desperately wanted to push that little button that would bring some relief. Alas The Beard declared "it eats petrol" and so it remained off. Which put me in a massive grump. Which I took out on some meringue nests that I crushed up to make a massive bowl of Eton Mess. There was meant to be a lot more in this bowl - some of it may have gone the way of the aforementioned chocolate bunnies.My grump was quickly eased by cream, fruit and pulverised meringue. I wish I could claim this marvelous Coffee & Walnut cake as my own - but it was made by my Aunt. I had a lovely time with my family where there was some guitar playing via The Beard and my Uncle and some putting the world to rights with my Grandad. Oh and there was also a quick snap of my frock. Which as it was St Georges Day I decided to make into a slightly patriotic theme. I know it should have been just red & white - but that dress was in the wash. So good old red, white and blue had to do. 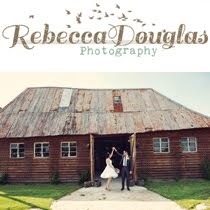 Dress & sandals via eBay for under £20 - win! Wilted curls - lose! Sunday was spent travelling a little further from my folks to attend a 1940's weekend at Crich Tramway Village Museum. The weather had cooled down a little, for which I was thankful. It was a perfect Spring day spent in the company of some of the best dressed folk I have ever seen. This was my humble offering and I have to confess that I was pretty self conscious all day - namely on account of my new snood, which you can only just see. It is lovely and I had some rather nice compliments on it and the whole ensemble - but I just felt a bit out of place. I'll wager it was me and not them. I was just having one of those days. Another eBay frock for £6 - yipeeeee! That aside - I had a wonderful day. The museum is pretty darn good, as was the ride on a 1929 tram. For an old penny. You can ride up and down all day if you want too - but it was pretty busy, so we only did it the once. I also got to meet the delectable Shona from Heyday Clothing. 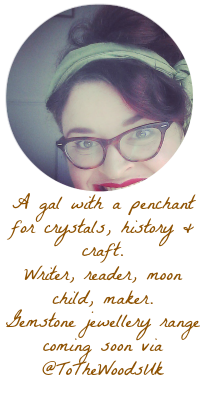 I think I babbled on a bit - as usual when I meet people for the first time and I was decidedly distracted by her necklace. I must get me something similar - pronto! She was incredibly lovely and chatty - just like her blog. The actual museum (which we nearly missed) is in fact, fab. It has trams going all the way back to the 1880's and a wonderful 1930's one. Which you can tramp up and down on - and pose for pictures. Which I of course partook in. And on account of the 1940's weekend there were also plenty of classic cars on display, which I applied the usual "hands on hips" pose to. I really must get a new stance. Oooh it's green - and it has a flag! We left at about 4.30pm which means that we missed out on a sing-a-long and much more frivolity - but it was a long drive back home. 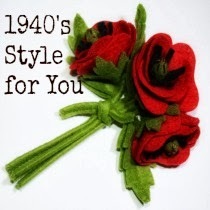 The next 1940's weekend is scheduled for 13th & 14th August if you are interested - but there are lots of other weekend events coming up - including a 1950's and an Edwardian. Before we headed off home, we visited a local WW1 and WW2 memorial tower dedicated to the Sherwood Foresters Regiment. The view from the top was amazing. So - all in all - it was a blummin' busy weekend! I hope all of yours were more relaxed with less driving and air con conflabs. And now I get to enjoy the rest of my "3 days for 11" off work. Well done those Windsors! Of shoes? Or Cherries? 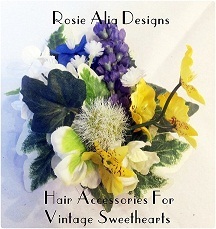 Or the clips that you can see on the top of my bonce? I don't know what else you would have thought I was referring to? Yep. My feet are still there. Phew. I have been trying to think of things to wear my navy skirt with - which wavers between fun and frustrating. But - I have finally hit upon a combo that I like. I once read / saw / was told / had a dream about - that you should not wear more than 3 colours at once when co-ordinating. I am not too sure I believe it, but I do keep it in mind when I am standing forlornly at the wardrobe door of an evening. Yes - that's right - for work, I get my outfit ready the night before. All via charity for a stonking £15. So I went with red, green and navy. And, do you know what? I rather like it. I especially like the knitted cherries which I hunted down and bought from Josie-Mary in her Folksy shop. Definitely one of my go-to outfits for work now. 5 mins outfit planning can pay dividends. Hurrahs! I came to this series purely by chance after checking out a box set sale last January. I had never heard of it before, but I am sure glad that I did. I think this is possibly my favourite opening title to a show ever. I love the way that it dives into the pictures on the Tarot cards and out again, linking in with footage from our collective social history. 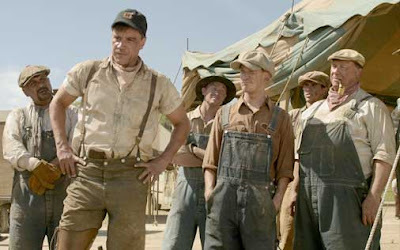 Set to the backdrop of The Great Depression and life in the Dustbowl of America - it ticked all the boxes for me. I am fascinated by circus/carnival history. The whole "travelling show" community intrigue me. And this show does not disappoint. Not once did I want to do anything other than applaud the fantastic writing, setting, acting, music and costume. That said, this is not, I feel, for the faint hearted. There is an incredibly dark, supernatural element to this show, which I personally loved about it. Alongside that it is fairly adult in content. More applause from me! It is not a scary show, not at all. It is deep rooted and well researched. Personally, on looking further into it, I think the writer Daniel Knauf, is a genius. The inter-connection of his characters is flawless. I think, by far, I love the cooch side to the show. I am not a pervert, honest.. I loved the dynamic of this family who are selling their souls, but have, what they feel are moral boundaries. The way life on the road is conveyed in this show is second to none. It gave me a real sense of what running away to the circus would have really of been like. 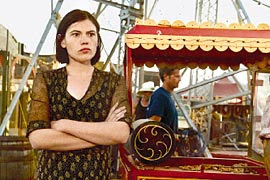 Carnivàle contains all the things you would expect a circus of the time to have - from a psychic to a Bearded Lady - and I found myself longing to know more about each one of them. I could not help but fall a little bit in love with each of them. But, as mentioned before, there is a dark element to this show which, although the main focus and narrative, it does not steal away from the character development of others. 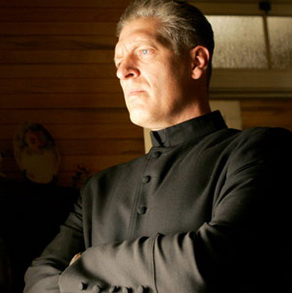 Clancy Brown is fantastic as Brother Justin and the relationship between him and his sister is a little alarming but believeable. The placement of these characters illustrates the parallel between the haves and have not's. My favourite character though has to be Rita-Sue, followed a close second by Ruthie. I think Rita-Sue embodies of the era, a sense of desperation and false control. But she paints her face and gets on with it for the sake of her family. 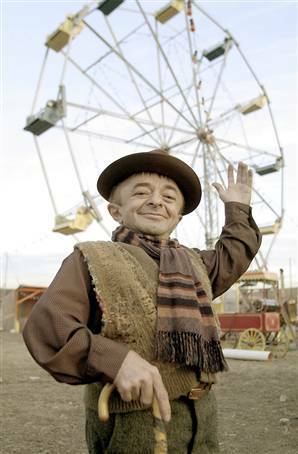 Carnivàle regrettably only lasted 2 seasons, but do not let this put you off from giving it a go. It does not cut off and leave you uncomfortably hanging - but it does leave you wanting more. Alas, this is all there is people - but it is well worth a watch. A ringside seat 9/10 from me! There are few things that transport me back to days gone by like the time machine that is music. Yes, I can do my hair, I can slick on red lippy and I can try to achieve some semblance of “the look” through various charity shop/eBay hauls. But, for me, music and the dancing that can accompany it, is where it’s at. You will find me in the kitchen, mp3-player-thingy up full blast, jigging around making dinner on any given evening, singing (badly) at the top of my lungs. And who do I duet with for my dancy-dinner-making? 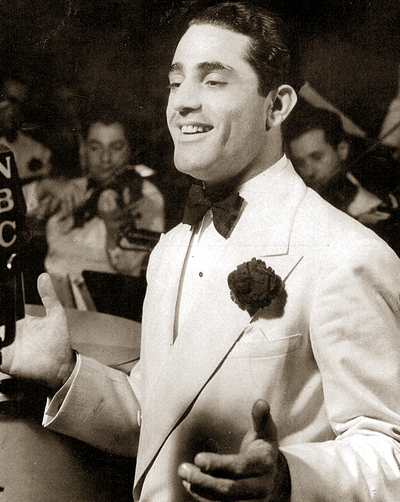 The late, and utterly great Al Bowlly. 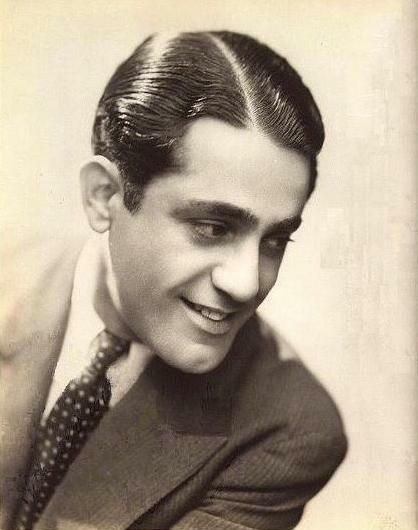 When I first got into the vintage scene, it was Al Bowlly who guided me. Today is the 70th anniversary of his death. I feel it high time I celebrated him and told you a little bit more…. Born in Mozambique in approximately 1898 to Lebanese and Greek heritage, he was predominately raised in Johannesburg, South Africa. Before singing became his main bread and butter he had other jobs that included being a jockey and a barber. During the 1920’s he joined a dance band headed by Edgar Adler, which afforded him the musical and singing knowledge he then went on to acquire. However, perhaps flippancy or childish behaviour landed him on the wrong side of the Adler when Bowlly threw a pillow at him on stage, resulting in his departure from the group. He then had to busk his way back home from Indonesia. More street performances ensued with the beginning of the Great Depression in 1929, whilst he waited for a brake. His patience paid off in the early 1930’s when he signed not one, but 2 recording contracts. 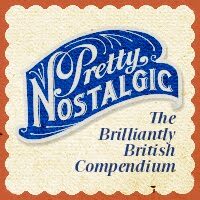 He went on to then record over 500 tracks which, accompanied by radio performances and a UK tour, inevitably increased his popularity. 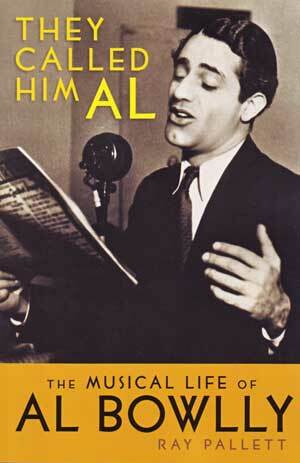 By 1934 he was being recognised as a tour de force in the US, landing his own radio show for NBC. However, his followers began to wane in the UK with his absence and his career came to an abrupt halt in 1936 due to a throat condition that nearly cost him his voice. Thankfully he made a full recovery. He returned to the UK in 1937 and recorded as much as possible and toured to try and recover the fans he had lost. He became popular again in 1940 after forming a duet with Jimmy Messene called Radio Stars with Two Guitars. 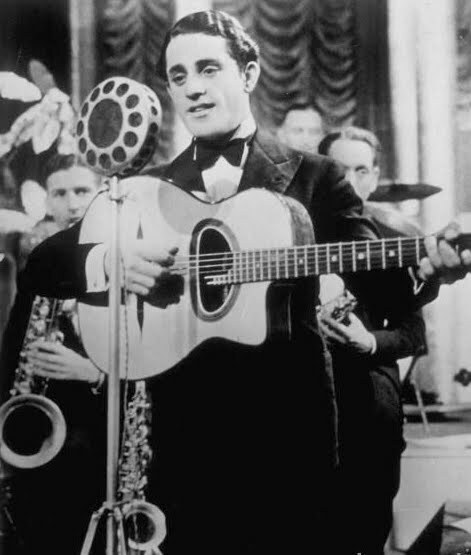 On the evening of April 17th 1941, after a show in High Wycombe and despite being offered a bed for the night, Al Bowlly decided to board the last train to London, preferring to be at home for the night. This proved to be a fatal choice when a German parachute mine exploded above his residence in Dukes Court, Jermyn Street. 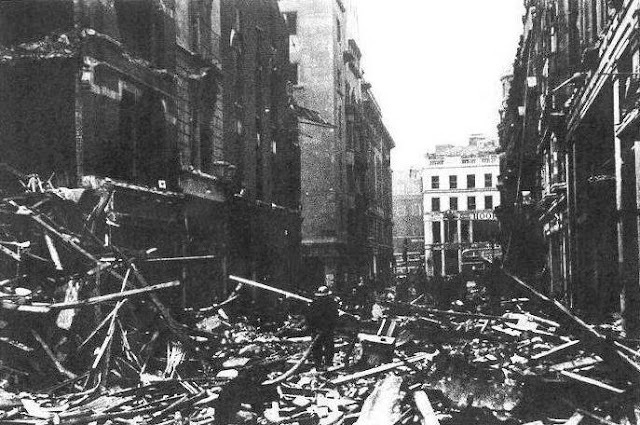 The explosion resulted in fatal head injury, caused by his dislodged bedroom door. He was buried in a mass grave in the City of Westminster Cemetery. He lead a varied and accomplished life, from finding his first wife in bed with another man on their wedding night to recording over 1000 tracks during his career. 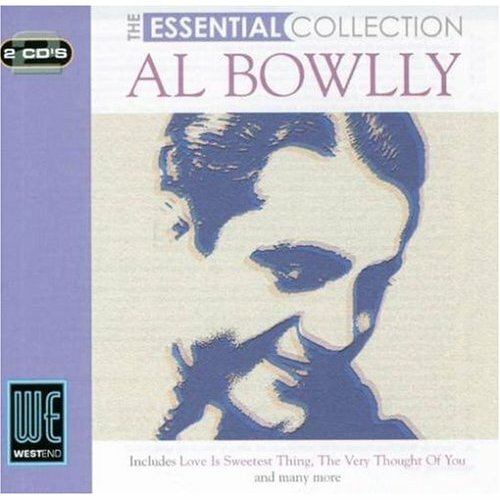 Despite crooning nowadays being associated with the likes of Sinatra or Martin, it is actually Bowlly who developed this style of singing. He was also the first artist to be credited on a record, as opposed to the band being the focus and he even had a solo spot on the Beeb. There are many of the tracks that he recorded that I love so it is hard for me to narrow it down to just one. But I have done it, and a recording of it is below. Each of them evoke to me the era, whilst remaining individual to his voice and style. If you are not familiar with his dulcet tones, then I urge you to nab a copy of his work. I favour The Essential Collection - but there are lots out there to be had. And the majority are under £5. Has this whetted your appetite for more? There was a theatre production recently called "Megaphone to Microphone" which has a FaceBook fan page. I just missed the last night - but I am chancing that there might be a repeat performance in the future. So, a salute to a man who, although long gone is as present to me today as he ever was to people in the past. The on going saga of what to wear on the dreaded dress down Friday is, well, on going. This is my latest effort. 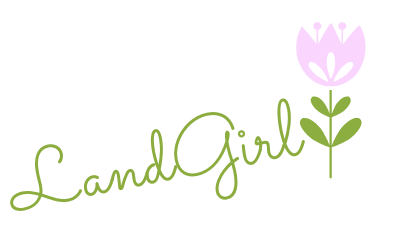 Land Girl by name, trying by nature. I feel compelled to wear jeans on DDF. I base whole outfits around them. Some are fails and shall remain unseen. But this one, I quite like. I got to wear a cardy-thing I had found at the bottom of a drawer and a head scarf I had forgotten the existence of. Win! And to accessorise, what else but an actual original Land Girl badge? I own a couple of these, both of which I found on eBay for a nominal value (under £3!) and when I look at one, I cannot help but wonder who owned it, where she might have tilled fields, milked cows, sunned herself and suffered all the aches and pains of her work. It may, to some, seem frivolous to wear this as a mere accessory. But, I am more than aware of it's significance. And I would rather it were worn with pride and remembrance, than in a drawer somewhere. And so... until next DDF - ta-ra! Few charity shop rummages produce treasure like the ones that are out of town. The ones that you think "the place looks like it should be condemned - I'll bet it's cheap". The ones you walk into, only to be greeted with a smell you cannot, and refuse to, identify. You are about to leave when you spot a homemade cardigan. You convince yourself that it was knitted by a Nana. And for £1.50 you clutch it to you like gold. Gold that needs a wash. The Cardy, The Winnie the Woolen and the Shoes. 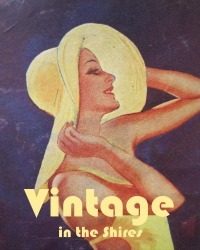 You wash it and dry it and put it straight on, with glee and gay abandon. You skip round your parents front room in it clapping and wishing you knew the telephone number of the Nana who knitted it. You want to buy her some flowers, you love it so. Well. That is how I reacted to this bargainous beauty! I am a sucker, at times, for packaging. Especially if it looks remotely retro. Even more so if it comes from Boots. I love Boots, always have, always shall. I love the helpfulness and politeness I have always experienced whilst shopping there. And I will usually buy something from the store, even though it may be a little more expensive than a competitor, because of the points I can collect and then spend. Anywhos - I am rambling. I am here to tell you about something I purchased based on packaging and smell alone. I was initially looking for some face wipes to get rid of pesky panda eyes - and then I started to think about cold cream. Not just Nivea, which is what I usually use, but actual cream that is marketed as "cold". I had a look along the row and pondered Ponds, even picking it up. But then I spied Boot's own version - their Traditional Skin Care Cold Cream, to be precise. And their Glycerin & Rosewater toner/moisturiser. A new flannel later and I was off. I used this as I would normally use my Nivea - but instead of cotton pads, I used a warm flannel. Oh my giddy Aunt - the difference! After slathering it on and wiping it off - I was left with plumped, clean skin that not only smelt nice and was soft, but was non greasy. I have gone back and tried the Nivea with a warm flannel - but it still leaves a slick on my skin. I then used the toner to get rid of all make up that had been playing hide and seek with the cold cream. I love the smell of this toner and the fact that I do not need another product to moisturise afterwards is a bonus. I think for the money, coming in at under £6 for the two, this is an excellent product. I know that there are others available, but this is a fab one to start with. You may find that cold cream does nothing for you, or you just cannot be bothered with the faff of putting it on and taking it off. I know that I, for a long time, favoured specifically manufactured wipes. But - no more. My skin, my sense of smell and my purse are all happy from the usage of this combo. Good times. "FORGOTTEN VOICES OF THE GREAT WAR was the surprise best-seller at Christmas 2002, selling over 60,000 copies in hardback alone. 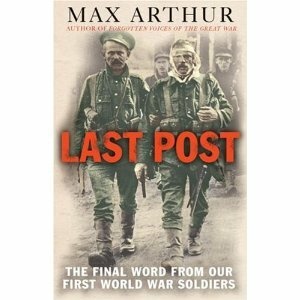 The formula was simple: Max Arthur interviewed some of the 30 surviving British soldiers from the First World War and combined their stories with other interviews in the Imperial War Museum and various private collections. LAST POST is very consciously the last word from the handful of survivors left alive in 2004. When they die, our final human connection with the First World War will be broken: after this book, we will have only recordings or diaries. 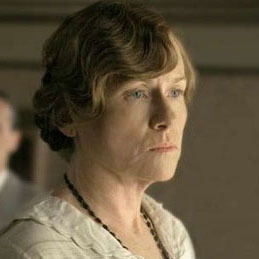 We will never be able to ask a question of someone who was there." I read this whilst in France on the WW1 trip last year, having picked it up at a charity shop a couple of months before I left. It is a heartbreaking and fascinating book. Heartbreaking because ALL of these men are now gone, and fascinating because 80 odd years later, the majority of their memories were still as fresh as they ever had been. Shame that it was horrific memories, eh. That said - it is not all doom and gloom - there are some funny and light moments throughout their stories, whilst others are a little dull in content. For that, I am grateful I guess, as is translates to me that their particular War was not as eventful or scarring as others. A great piece of history to have on your book shelf - if only to dip in & out of and remember the nearly lost youth of the aged gentlemen they were lucky enough to become. So. After the stupid o'clock start I face each day, this place is my first port of call when I get into the office. The bogs. Nice. Nice indeed - not have they recently been re-done - they are also clean & empty at that time of the morning. Bliss. Hence the quick outfit shot. I always go straight in here to sort out my hair and finish off my makeup. I just don't have the time in the morning before I leave to style my head. No point in pinning my hair into place only for it to be ruined by a hat. So I don't. Jumper & Skirt £8 from charity haul. Belt & Brogues - Primark. Photographic evidence, my chums, that I DO own other brown skirts, rather than my staple woolen which seems to have more than a cameo in my outfit posts. In fact I am trying to wear The Woolen less and less at the moment - for fear of drab skirt-age in my future posts. Plus - I do love it so, that I worry something unfixable might happen to it. The mere thought of that has made me go cold. *shudder*. So - this is what I wear, when I am not wearing The Woolen. Is it sad of me to be thinking about naming that skirt? Don't answer that.